this past week was the 2009 World Track & Field Championships in Berlin. 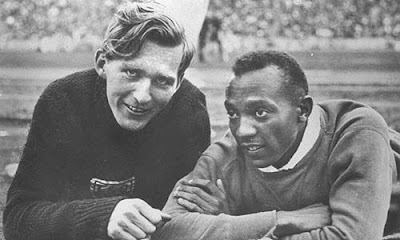 apart from the sports, this year's competition was notable because it was hosted in the Olympiastadion, which was first made infamous as the site of the 1936 Berlin Olympics but ultimately became famous as the site of the transcendant performance of Jessie Owens in the face of Nazi Aryanism. one of the lesser-known stories of Jessie Owens at the 1936 Olympics was his relationship with German competitor Luz Long. which is a shame, considering the significance of the message their relationship leaves for the rest of us. this post is my part in the efforts to keep that message alive. at the 1936 Olympics, Jessie Owens was struggling with the preliminaries in the long jump. he'd fouled on 2 jumps by stepping past the take-off plate, meaning that with a 3rd foul he would have been disqualified. German jumper Luz Long gave Owens advice and assistance, with the tip that he mark a spot well in advance of the take-off plate so that Owens would avoid fouling. Owens did so, and managed to land a clean jump and qualify for the finals. reportedly, Hitler was furious, especially since Long's advice subsequently allowed Owens to then break the world record and go on to win the gold medal. it didn't help that--in full view and open defiance of the Nazi leadership--Long embraced Owens and helped lead the crowd in cheers for him. Long and Owens became friends thereafter. unfortunately the story has a bittersweet ending. Long was drafted into the German army during World War II and was killed in Sicily. still, Owens regularly visited Long's family in the years following the war, and made it a point to tell Long's children the kind of man he was. i should note here that in recent years this story has been assigned to apocrypha, with a number of sources questioning whether it ever really happened. observers claimed they never saw the alleged long jump exchange between Long and Owens, and Owens himself eventually admitted to some distortion of events because he said it made for a version the public preferred to hear. "someday find my son ... tell him about how things can be between men on this Earth"
you see, we tend to become cynical in life. we tend to give up on ideals and aspirations, turn away from what should or can or hope to be. we rationalize such surrender, tell ourselves that all of this is nothing but dreams, say to each other that the world is about reality and that reality is about what we need to be. we do this so often that we come to believe it to be the truth. and because of this, we end up accepting the world the way as it is. that it won't change. that it can't be better. that it has set the conditions for our lives, and that there is nothing we can do to make it otherwise. and it is because of this that human history is the tragedy that it is. it. does. not. have. to. be. this. way. we can do something to make it otherwise. we can set the conditions for our lives. it can be better. it will change. the world can be more than it is. the world can be more than reality and more than reality is what we need to be. we can be about dreams. about should and can and hope to be. about ideals and aspirations. and it can be as simple, as elegant, as graceful, as eternal, as powerful, as supreme, as just reaching out across the gulf that lies between us and connecting one soul to another in an act as pure as the first communion. and in that moment of unison we redeem ourselves and make human history the triumph it was meant to be. i believe that Long's last letter to Owens speaks to this message. and i believe that his death was a sacrifice that should not be allowed to have been made in vain. Owens certainly deemed it important enough to follow through on his friend's request to speak to his children about the kind of man their father was. and their father was the kind of man who was about more than the world around him...and who at a certain moment in history dared to make the world more than it was. i can only hope that somebody can tell my kids the same thing about me. exercise doesn't make you thin...uh, excuse me?